﻿﻿It’s not all bad news this year, despite the drought. ﻿﻿﻿You know conditions are bad when this is the best thing you can say about wildlife habitat: The vegetation has died back enough so that game birds can find previously hidden seed on the ground. And that’s seed from seasons past. There has been relatively little seed production throughout Texas this year since it quit raining in September 2010. On top of that, a lot of what was on the ground from years past practically turned to popcorn as wildfires raged over it, followed by a stream of 100-plus-degree temperatures. Bear in mind that we research this forecast during the summer and a lot can change by opening day. Droughts eventually break, often with massive storms. All we can offer are informed opinions about how it looks at press time. While a game biologist, former Texas Parks and Wildlife Department Executive Director Bob Cook once asked me how I could expect him to forecast fall conditions when the bluebonnets were still blooming. This year, we’ve broken the forecast into two parts, covering doves and teal in the September issue and the rest of it now to give TPWD biologists an additional month to evaluate game and conditions. Here’s what they say. TPWD pronghorn program leader Shawn Gray acknowledges that pronghorn populations usually rise and fall in direct proportion to precipitation in the Trans-Pecos. Dry weather in 2008 led to poor fawn crops. When it began raining again in the Trans-Pecos, the herd in the Marfa Plateau still failed to respond. Therefore, the Trans-Pecos population has sunk to the lowest level since the 1940s. Research has revealed intestinal parasites in large numbers in the Marfa Plateau, which could be inhibiting reproduction. To the northwest, however, Hudspeth and Culberson counties have strong populations and buck quality is high, according to biologist Jason Wagner. West of San Angelo, a good fawn crop last year helped sagging numbers in the Permian Basin herd, reports John McEachern. The Panhandle herd has been growing the last several years and causing increased crop depredation, so 200 pronghorn were relocated from the northwest Panhandle to the Marfa Plateau. Time will tell whether this helps to increase populations; however, researchers are gathering a wealth of knowledge concerning possible reasons for the continued decline in the Marfa Plateau, pronghorn ecology and movements, and tweaks to improve future relocations. Trey Barron in Amarillo notes that dry conditions throughout West Texas will hold horn development down. Others agree. “Desert” is their first name, so they fare better during dry conditions than most species. Froylán Hernández reports that a healthy herd and increasing numbers indicate about the same number of rams available for harvest this season as last. Numbers may not be at an all-time high, Trey Barron observes, but expect good hunting in irrigated grain fields adjacent to good cover, like Panhandle Conser-vation Reserve Program (CRP) land. They’re everywhere! Except perhaps in arid West Texas. They like water. District leader David Forrester (La Grange) has plenty of hogs in his district: “Drought doesn’t seem to negatively impact production all that much, but it does congregate them in riparian areas (river/creek bottoms) and other water sources.” Evan McCoy, on the drought-depressed Kerr Wildlife Management Area, says in the Hill Country, even the hogs look poor. 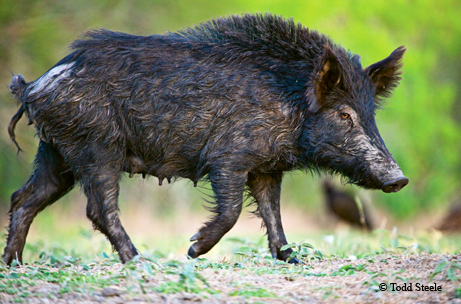 In Llano and San Saba counties, Dale Schmidt reports that last year’s abundant acorn crop enabled hogs to raise many piglets, which will be of prime size for hunters this season. They’re delicious. A new law now permits landowners to market hog hunts from helicopters, too. All biologists report little or no rainfall, no forb production, poor insect hatches and lack of nesting and brood-raising cover. And good hunting depends upon good summer hatches. The north-central Texas forecast is equally dismal. The one bright spot may be around De Leon. James Edwards files one of the few hopeful reports from there, saying good April and May rains helped with forb production. A hatch is possible. David Forrester of La Grange says some quail are also nesting in his area. In South Texas, Matt Reidy praises last year’s good rainfall that gave that region a good hatch and carryover. He’s hopeful some will reproduce. 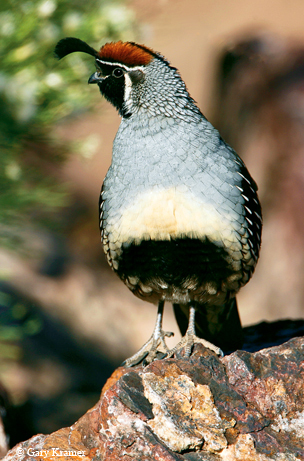 David Synatzske, manager of the Chaparral WMA, says an inch of spring rain started the quail to calling. “They’re trying,” he says. Although the drought may inhibit reproduction somewhat, the population remains strong in South Texas and the Trans-Pecos. Javelinas, also known as collared peccaries, are an underhunted species. Most hunters abandon javelina hunting shortly after dressing and tasting their first one. Jason Wagner suggests hunting at water sources during this drought. The eastern half of Texas has the heaviest squirrel populations; rabbits are found throughout the state. All species of wildlife suffer during a drought, and small game is particularly challenged by predators whose food supply becomes scarce. In the Pineywoods, district leader Gary Calkins points to the spotty acorn crop last season and says it resulted in some areas having adequate acorns and a good carryover of squirrels, while others don’t. That could make hunting tough in some places. Moving west into the post oak region, district leader David Sierra in Tyler says adequate spring rains fell to ensure a good acorn yield. He expects good hunting. Rabbits will suffer more in a drought since grass dies quickly, so they may be sparse. This might be a good year to introduce kids to predator hunting. Like bighorns, a mule deer’s first name is “desert.” They obviously fare better than most species, even in a desert as devastated as this. Fire and drought are a disastrous combination. Mary Humphrey, biologist in Sonora, notes that the mule deer on the western edge of Crockett County are doing all right, helped by a good mesquite bean crop. Jason Wagner in Fort Stockton says the Trans-Pecos deer numbers won’t suffer, but their fawn crops, antler development and body conditions will. In the Panhandle, Russell Martin says hunting should be satisfactory in native rangeland with enough browse. Ruthven, on the Matador WMA, expects only average antler production. Unless you started reading this forecast in the middle, you have heard as much as you will ever care to about “drought,” “no forb production,” “no fawning or nesting cover,” “no rainfall since September,” “below-average antlers” and so on. It’s a grim forecast if you look just at range and habitat conditions. But there’s more to a deer season forecast than the habitat and game conditions. Biologists refer to antler development as a three-legged stool: one leg is genetics, one is nutrition and one is age. Genetics is beyond the scope of this forecast, and probably the hardest to delineate across a landscape, anyway. Nutrition gets more ink from year to year because changes in rainfall are so visible, as they certainly are this year. It’s a given; wildlife is stressed. In the Trans-Pecos, Jason Wagner speaks of hunters reporting seeing many 4½- to 5½-year-old bucks last season. Mike Miller reports for North Texas and quotes James Edwards as saying of last season: “Fewer young bucks are being reported in the harvest. 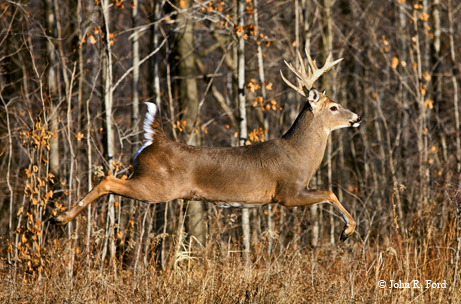 Landowners have seen better quality deer over the entire area.” Management is helping. David Sierra reports that in the post oak region of East Texas, antler restrictions are bringing more older bucks into the harvest. The younger bucks that were allowed to walk last year are a year older now. There can be no disputing that body conditions and antlers will be below average this year, as Charlie Newberry in Henrietta and Ralph Suarez in Ballinger and practically every wildlife biologist contributing to this report mention. It’s statewide. Current range conditions, though, when coupled with low harvests of a large age class, indicate that there could be a lot of bucks in the 4½-year age class and older out there looking for food this season. And where will they look? Oh, to own a feed store! First you have to have birds; that’s the bright spot. There has been a lot of water in the north, and breeding was exceptional. Of the 10 species traditionally reported, Waterfowl program leader Kevin Kraai says eight of them either increased in number or remained about the same as last season. Scaup and American wigeon remain below their long-term average. Northern shovelers, blue-winged teal and northern pintails, however, were prolific. Northern shovelers and bluewings reached record highs (4.6 million and 8.9 million, respectively), and northern pintail numbers surpassed 4 million for the first time since 1980! Pintails, though, are still below North American Waterfowl Management Plan population goals. Scaup numbers were similar to 2010 and remain below their long-term averages. But the birds also need water, and that could still be a problem unless Texas gets good rains between now and the start of the season. Even with ample rain and cold temperatures, Kraai warns that the drought may have already taken a heavy toll on food sources in wetlands. He says the key will be to hunt near irrigated waste grain. If rainfall remains skimpy, impounded streams or pumped water may be the only hope. He offers one more or less drought-proof tip: redheads and pintails have had multiyear increases, and the seagrass beds along the lower coast and midcoast could be productive. No report is available yet on goose prospects. Turkey hunters don’t depend upon the current year’s hatch. That’s good, since there won’t be much of one. But, as Rufus Stephens says of the Hill Country, “Because of a great hatch last year, the overall turkey population is in good shape.” Upland game bird specialist Jason Hardin echoes that statewide and says Texas has approximately 500,000 Rio Grande turkeys. In South Texas, Daniel Kunz says, “There are jakes everywhere!” Ruthven, on the Matador WMA, though, warns that as rodent species decline, coyotes and bobcats will set their sights on turkeys. Mary Humphrey sees that as another reason to reduce predators.